This unusual term is used for when surgery is used to 'save' a leg or arm. However, the techniques and technology can now be used to 'save' a leg where a knee or hip replacement has failed so badly that amputation is a real possibility. 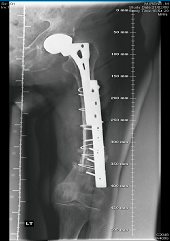 Problems such as severe bone loss or infection are the most common problems which lead to this situation. Mr Jeys has built up a national reputation for attempting to reconstruct the limb following such cases. He lectures around the world on this subject and gets referrals on a national basis. An example of a multiply revised total hip replacement in an 82 year old lady from South Wales. She was told that there was no options left for her and she would be confined to a wheelchair. She underwent a total femoral replacement and now walks without any sticks! Another example of a fracture of the femur in a 92 year of lady which had failed to heal despite several operations and 5 months in bed. 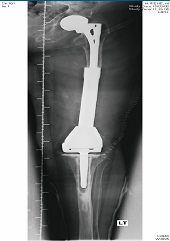 She underwent a distal femoral replacement as a last resort and is now mobile with a single stick.